President Prince was born and raised in Northern California. He served his mission in Cali, Colombia in 1975-1977. He graduated in business finance from Brigham Young University and received his MBA from the University of Utah. He made his career in the secondary mortgage market and traveled the world doing investor relations. He has served as a Bishop, High Councilman, Counselor to the Stake President, Stake and Ward YM Presidents, and 5 years as an early morning seminary teacher. He is at home with his guitar in his hand or with his running shoes on. He and Sister Prince have 5 children - 3 girls and 2 boys. Both sons have served missions - one in the California, San Diego mission and one in the New York, New York North mission. They have 10 grandchildren (4 of which have been born since our arrival in Colombia!) --8 grandsons and two granddaughters. President Prince thinks Heaven is a good nights sleep and happy children! Sister Prince was born and raised in Northern Utah. 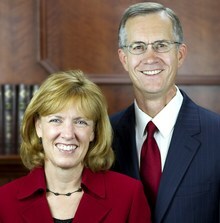 She attended BYU where she met her Prince, married him in the Salt Lake Temple and started "living happily ever after". She has served in the Primary, Young Womens, Relief Society, and early morning seminary. She loves to cook, read, go for long walks, and be with her children and grandchildren. Sister Prince thinks Heaven is having everyone around the table for game night!